The Princess Juliana airport in St Maarten has been one of the Island’s main attractions for tourists who loved the thrill of hanging on to the wire mesh fence to feel the force of the air as planes land on the short runway. Since Hurricane Irma hit the island with winds over 200 mph a week ago, there has been no fence, nary a beachgoer in sight and the only thrill of planes landing are the water and other vital supplies they bring and the promise of escape. Manned by the Dutch army, which now maintains order on the island, the award-winning airport is only open to relief and military flights. With no electricity and no tower control, pilots navigate the treacherous skies to land on the short runway. Flying in reveals a scale of destruction that really has to be seen to be believed — a devastation that could be likened to the aftermath of a nuclear explosion. Hotels that fringe the airport are now empty shells, their yards littered with debris and overturned cars. A small plane laid overturned on the grass along the runway. On the Eastern end, cars, boats, trees all laid mangled at the side of the road. On Saturday, as BW 3416, a Caribbean Airlines relief plane descended into St Maarten, the CAL staff gasped at the post-apocalyptic scenery. “I don’t know this place," said Dionne Ligoure, Communications Manager of the airline. She fought back tears as she surveyed the destruction. "This place had a vibes — it went from zero to ten,” she said. “It looks like a different place,” said a flight attendant. 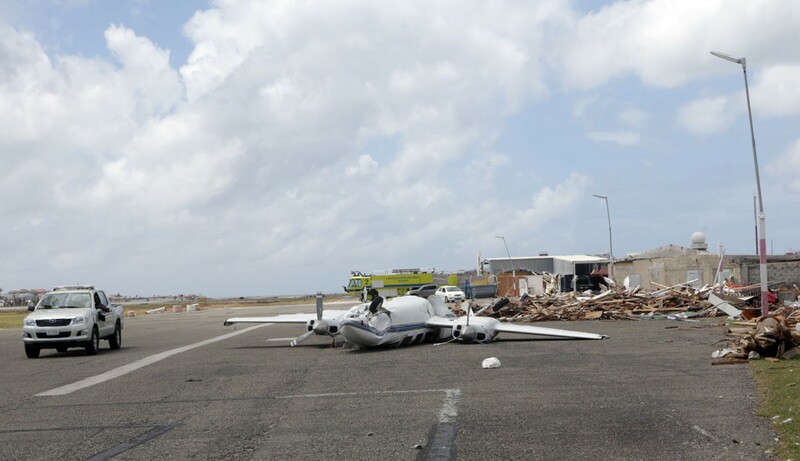 Though the physical structure of the Princess Juliana airport is standing, parts of the roof have been destroyed. Inside, in the baggage department, people waiting to board flights sat in a holding area in the dark. The foyer and ticketing areas were still flooded, and a damp stench hung heavy in the air. Outside, fiberglass stripped from the walls and ceiling of the airport, laid in mounds. The stench of decaying animal wafted on the hot, dry wind. The airport’s car park was filled with abandoned cars, some overturned, many damaged. Garbage bins were stuffed to capacity and despite the heat, pools of water were still collected in spots. Since Irma, tourists and residents have been lining up outside the airport hoping for flights out. 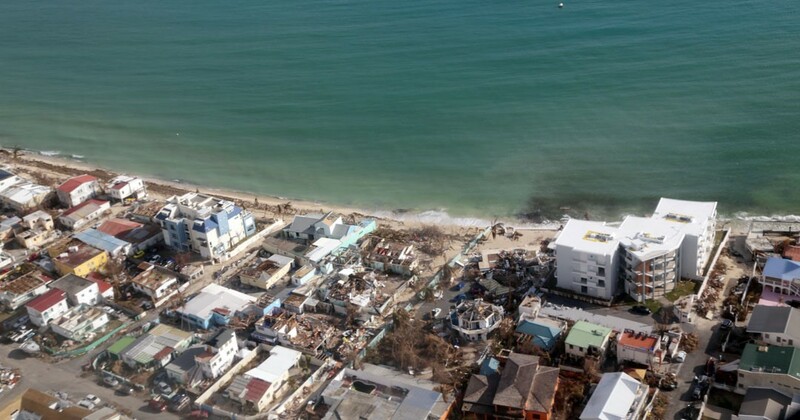 June Douglas, CAL’s agent in Sint Maarten, estimates that 20,000 people have left the island since the Hurricane. 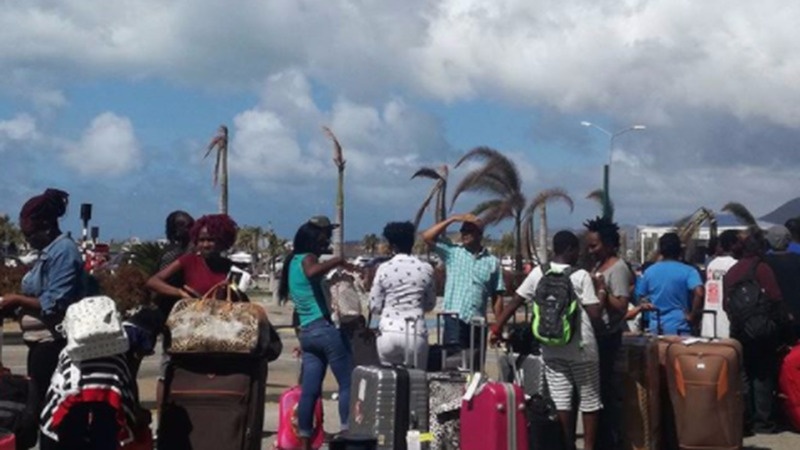 On Saturday, Caricom nationals, people from the Dominican Republic, European tourists and others, stood outside the airport waiting for flights to their countries of birth — even if just for a few weeks to catch themselves. At the entrance, a soldier speaking in Spanish urged the crowd to form an orderly line while CAL agents and Trinidad immigration corralled anxious Caricom nationals. Among them, Beverly, a mother of three from Guyana, who has been living in Sint Maarten for ten years. She started going to the airport four days after the storm, hoping to catch a flight to Trinidad en route to the land of her birth, but her youngest, born in French Saint Martin, did not have a passport. “I lost everything, my entire roof went, everything. I stayed in a shelter for a few days but it was too crowded, I couldn’t take it, I had to leave,” she said. She said they were "blind and deaf" in Sint Maarten, having no clue as to what was happening in the country. Tanny, a businessman from the Dominican Republic, had been going to the airport since Wednesday. He lost his home, he said, and had been staying at a friend’s house. Mikkel Blackman, a 19-year-old Trinidadian, was returning home after vacationing in Sint Maarten where his father Kyle lives. The family stood out in the crowd of weary-looking folks, eating their fried wings and downing cold beers. The elder Blackman, who is in construction, said their house, unlike many others, survived the storm. They watched houses, roofs, and people fly down the street during the storm. The storm’s aftermath means a lot of work for Blackman unlike many others who are now jobless with the decimation of hotels, restaurants and countless other businesses. 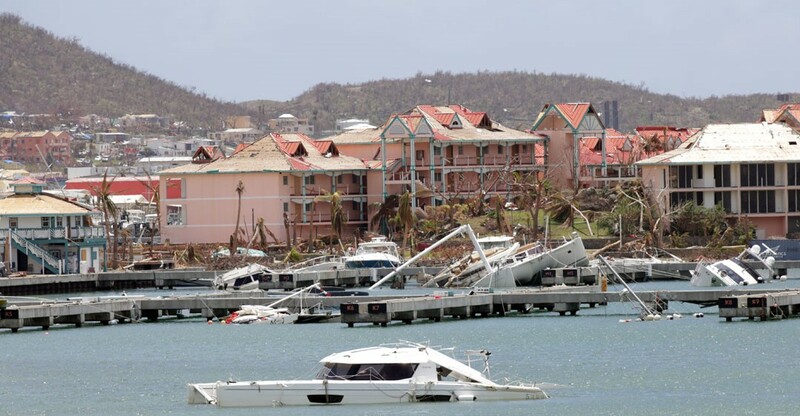 “There is a lot of unemployment," said Haneisa, a Trinidadian living in Sint Maarten. She was eager to dispel reports of violence on the Dutch side of the island. “The looting and stuff were true but the excessive killing and stuff was not true, they really exaggerated,” she said of international reports. She said the Dutch military moved into the island very early and the borders between the Dutch and French sides have been closed. There is also a daily curfew from 3 pm to 8 am. 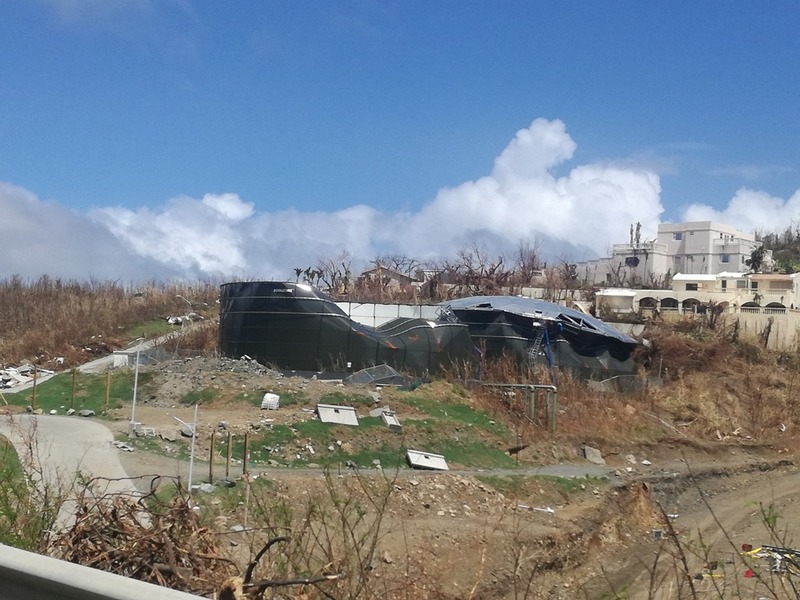 Driving around affected areas of the island showed very little activity beside people driving around in cars with busted windows and windscreens. 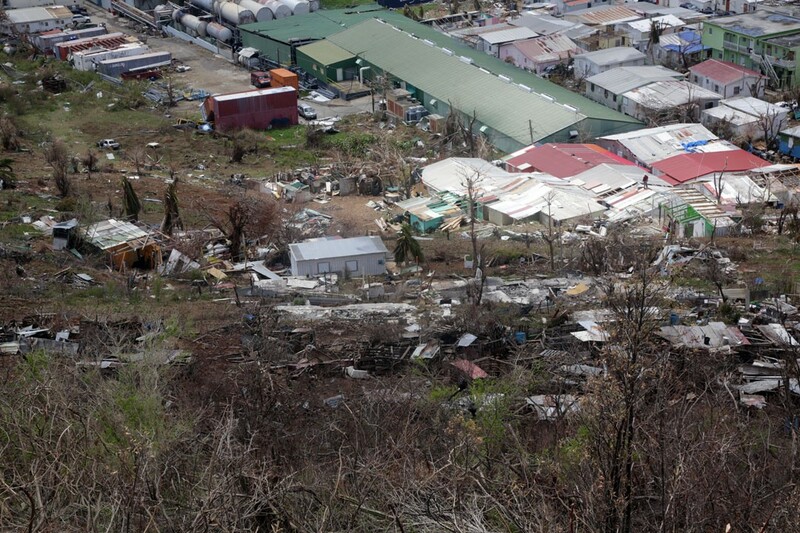 Maho, an area popular with Caribbean tourists, was severely affected. 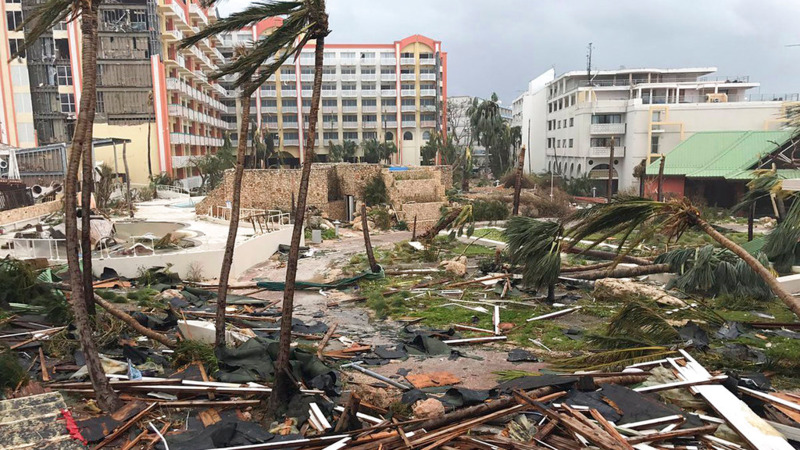 The Sonesta Maho Beach Resort and Spa was destroyed, along with popular nightclubs and casinos. Fallen trees and branches littered the roadways along with galvanise that blew from roofs. Apartment buildings showed cracks, missing windows, and blown outdoors. And parking lots were strewn with overturned cars. In the marina, yachts, catamarans, and fishing vessels were either lodged on top each other onshore or overturned in the water. 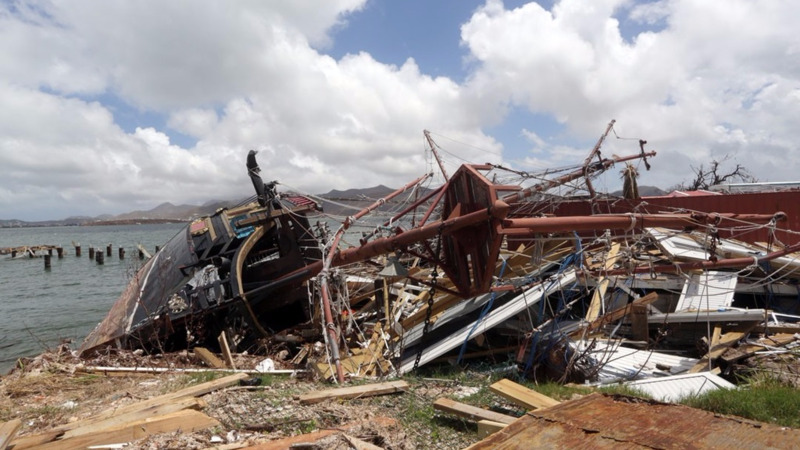 The Pink Iguana, a floating restaurant, was overturned several hundred yards from its original location. In Cole Bay, some pharmacies, supermarkets, and bars showed signs of human activity despite fallen signs and debris around them. There were signs of a clean-up in progress. There was a huge mound of galvanise in an empty lot that we were told would be melted down. 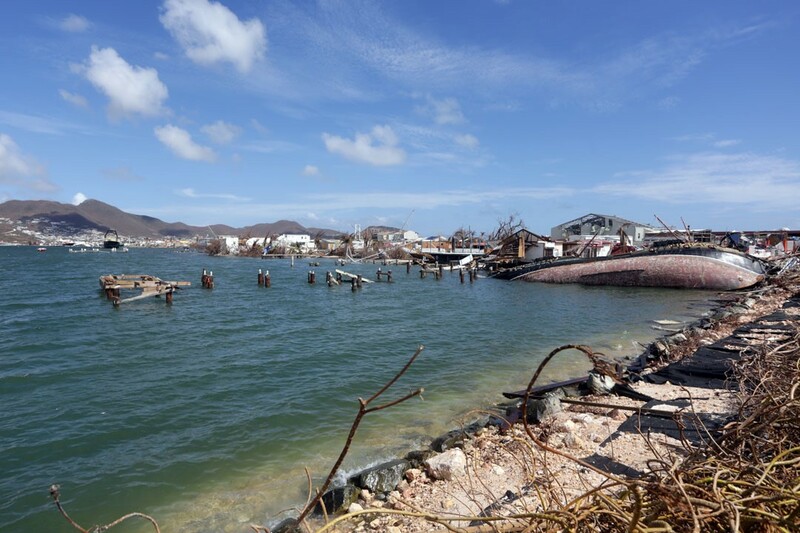 In the yard of one house, a fake Skeleton held a sign stating that the people of Sint Maarten are resilient. For those who chose to stay, the mood is certainly hopeful as the Prime Minister, William Marlin, has assured that with telecommunications operational and radio stations broadcasting, it’s the little things that will get them along the way. Douglas, our guide, said gas stations are open but people are only allowed to collect the gas in containers to avoid traffic, and can only pay in cash. The Windward Island Bank has also reopened, she said, and is offering a six-month grace on loans and is allowing withdrawals up to 1000 guilders. Back at the airport, the crowd was significantly thinner. By 2 pm, those who weren’t successful getting on a flight were hauling their suitcases back to their cars and heading home before curfew and before the scorching sunset.